This Monitor Stand Is Impressive! Buy Monitor Stand that Fits 50" Flat Panel TV Online! Buy Television Stands Online Today! Mural measures 10'w x 7-1/4' tall to create a highly visible exhibit! 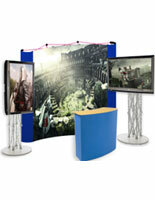 The monitor stand features a large mural banner frame with high resolution, 1200 dpi panels that your company designs. The 10' wide x 7-1/4' tall mural stands out in every setting! The monitor stand that fits 50" flat panel TVs also includes a molded hard plastic case for ease of shipping and storage. The wheeled case is easily rolled to any spot on the show-room floor. Custom banner-style graphics are printed directly onto 22mil PVC panels with a matte finish. Most importantly, these panels do not tunnel or separate, even after years of rolling and transport! 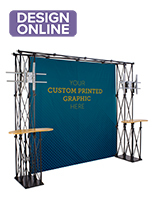 Buy these impressive tradeshow units for use at your next company event! 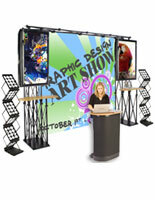 This monitor stand is ideal for tradeshows, exhibitions, and conventions. The system includes a variety of items that fit together create an effective marketing display. 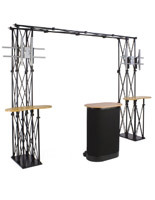 The monitor stand uses two (2) black truss TV stands that each support up to a 50" television that weighs no more than 80 lbs. The easy to assemble stands require few tools, as the rods are self-screwing. The pop-up counter display is much like the TV stands. This counter sets up in minutes and features a large display area for brochures and product samples. The tradeshow display, monitor stand has hook-and-loop receptive material on which various accessories may be attached such as literature trays and graphics. Within the counter are (3) smaller shelves. The monitor stands feature standardized brackets that fit most television brands including Sony, Vizio, and LG. Buy monitor stands that fit 50" flat panel TVs online and save with cheap wholesale pricing!